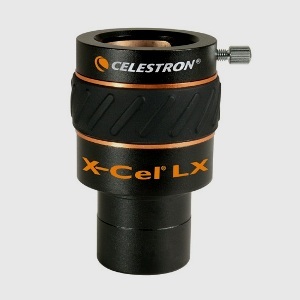 Barlow lenses offer an easy, economical way to increase the magnification range of your eyepieces, and Celestron carries three of these highly useful lenses. A Barlow lens doubles the magnifying power of your eyepiece by doubling its effective focal length. For example, an 18mm eyepiece used with a 2x Barlow lens would have the magnifying power of a 9mm eyepiece. Its like having two eyepieces in one! 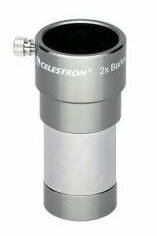 If youre looking for an affordable way to achieve high-power viewing of the moon and planets, double stars and even close-up views of terrestrial subjects, a Barlow lens is the answer. Barlow lenses mount into either your telescopes focuser or visual back. A quality 2x Barlow lens with a brass compression ring to accurately centre your eyepiece and prevent marking the barrells. With fully multi coated optics and precision design this Barlow will double the magnification of your eyepieces without compromising optical performance. Thoughtful ergonomic design includes an easy grip rubber surround for ease of use with gloved hands or in cold weather. Barlows are also ideal for increasing magnification when imaging the Moon and Planets with webcams and Solar system imaging cameras. This Barlow lens doubles the magnifying power of your eyepiece by doubling its effective focal length. For example, an 18mm eyepiece used with a 3x Barlow lens would have the magnifying power of a 6mm eyepiece. Its like having two eyepieces in one! A quality 3x Barlow lens with a brass compression ring to accurately centre your eyepiece and prevent marking the barrells. With fully multi coated optics and precision design this Barlow will double the magnification of your eyepieces without compromising optical performance. Thoughtful ergonomic design includes an easy grip rubber surround for ease of use with gloved hands or in cold weather. Barlows are also ideal for increasing magnification when imaging the Moon and Planets with webcams and Solar system imaging cameras.